Clear, simple verse-chorus structure, with middle 8 – POPULAR SONG FORM. Simple melody line – catchy and memorable – harmonised in chorus by backing singers. A basic is one repetition of the main dance. A restart is a point at which the basic dance sequence is interrupted and the dance routine starts again from the beginning. What? A fusion of traditional Indian and modern club. Where? Punjab (India) and English Club Dance. Male vocals / narrow range / in Punjabi. Shouts of “hoi” from backing singers. Dhol drum (double headed) playing the chaal. Originally a male dance / energetic steps and actions. A group dance with acrobatic stunts. Bhangra is often danced in circles and uses a lot of arm and shoulder movement. Venue / Location - Club, Wedding, Celebration. Tempo - 4/4 (12/8) Medium / Fast, consistent tempo. Articulation - Strong accents on first beat of bar. Devices - Shouts of Hoi! Loops, samples and digital effects. Texture - Melody and accompaniment (instruments support vocal melody). 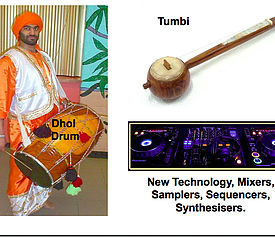 Instruments - Tumbi (stringed instrument), Dhol drums, Drum machines, synth bass, samples etc. Pitch - High pitch male vocals over limited range of notes. Other...Fusion, Punjabi & Western club dance, group dance, stunts, Panjabi MC. Group, Synchronised dance.